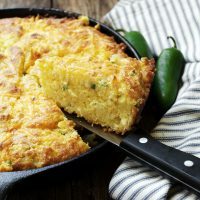 Delicious skillet cornbread, flavoured with roasted jalapenos, cheddar cheese and corn kernels. A great use for left-over cooked corn! Place diced jalapenos in skillet, then place in a 10-inch top diameter cast iron skillet in cold oven on middle rack. Preheat oven to 400and leave skillet with jalapenos in oven as it preheats. in pre-heating oven. Check periodically to make sure they aren't burning and to give them a quick stir. Remove when they are lightly browned and allow to cool. Return skillet immediately to oven. In a medium bowl, lightly beat eggs in a medium to blend. Whisk in corn/cream mixture and cheddar cheese. Set aside. In a large bowl, mix butter and sugar together with a wooden spoon, just until butter absorbs the sugar. Add the egg mixture and mix until just combined. Stir in the cooled jalapenos. Mix in the dry ingredients just until barely incorporated. Remove skillet from oven and lightly coat with nonstick spray. Spoon batter in to hot pan and quickly top with a bit more grated cheddar cheese. Bake cornbread until top is golden brown and springs back when gently pressed, 25-28 minutes when baked in a 10-inch skillet (may be longer if your skillet is smaller). Let cool 10 minutes before serving. *This means you add the corn kernels to a measuring cup first, then pour in the milk until the milk rises to the 1 1/2 cup level.